Exactly two years ago I wrote an article in this space under the heading Has LeapFrog really come back? 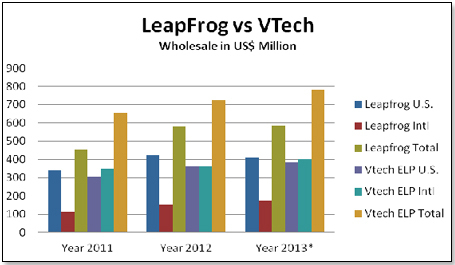 Will LeapFrog continue to hop past VTech? I then said that they indeed had turned the corner but that there were major challenges ahead - competition, product innovation and worldwide demographics. Yes, LeapFrog has indeed turned the corner but these challenges continue to persist. At this point in time, LeapFrog and VTech rule the roost. 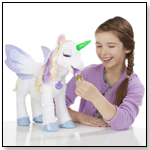 All other entrants, including Mattel's IXL, have failed. In addition, more general children-focused tablets have entered the market place – e.g Tabeo by ToysRUs and Kurio’s 7s – but have so far not made an impact. Both products are expensive - $129.99 and $149.99 – and both provide educational apps but appear to be completely opportunistic entries with no strong educational content. What both companies have failed to take into account when launching these products into the electronic learning space is that mothers do not buy these gizmos as toys but as learning aids for their children. To be accepted as such takes time, word of mouth, and solid educational content. Neither the Tabeo nor the Kurio meet these criteria. 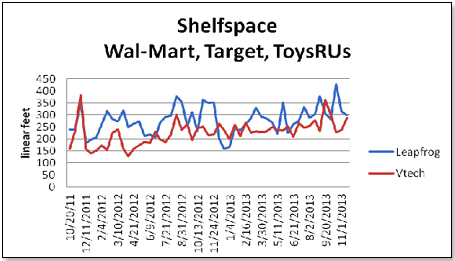 At Target, ToysRUs and Wal-Mart, LeapFrog and VTech have traditionally had pretty similar shelf space metrics. What is interesting is that LeapFrog is buying shelf space with promotional pricing to a much greater extent than VTech. Looking at the price offers for the top 49 SKUs of both at Wal-Mart, Target and ToysRUs on November 23, 2013, we see that LeapFrog is discounting 77 out of a total of 147 SKUs whereas in the case of VTech it is 48 out of 147 SKUs. 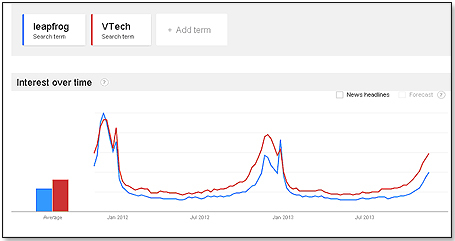 In terms of product innovation, LeapFrog and VTech are running neck-to-neck. Both came out with a new and considerably beefed-up product in July, 2013. VTech beat LeapFrog by two days when they unveiled their Innotab 3s on 7/15 and LeapFrog followed suit on 7/17 with their Ultra. There is not much to choose between the two systems in terms of product attributes – both are Wi Fi capable, both have plenty of free apps, both have cameras and video recorders. The difference is that the Ultra has a larger screen – 7” versus 5”, two cameras to Innotab’s one and more capacity at 8 GB versus Innotab’s 4 GB. There is also a very major difference in price – the Leappad at ToysRUs retails at $149.99 whereas the Innotab 3s is only $79.99. Leapfrog was betting that the Ultra would essentially take over from the Leappad 2 and the retailers shared this assessment. And they were right at the start. The Leappad Ultra took off like a rocket. Unfortunately, the consumers quickly came back with complaints that the Ultra did not live up to their kids’ expectations. What nobody anticipated was that the Ultra would have serious initial firmware problems that resulted in a freezing screen, very slow loading, very slow for typed text to appear and other issues. This had a very negative effect on sales and whilst the shortcomings have apparently now been totally corrected, the image of the product has been affected, at least for the moment. In fact, the Ultra is doing very badly in LeapFrog’s three key international markets – Canada, France and the U.K. In contrast, Innotab 3s had none of these issues and began to challenge the Ultra for market leadership wherever both tablets are on sale. As a result, VTech’s overall sales performance in the U.S. has improved to the point where they are running neck-to-neck with LeapFrog during the last two months. 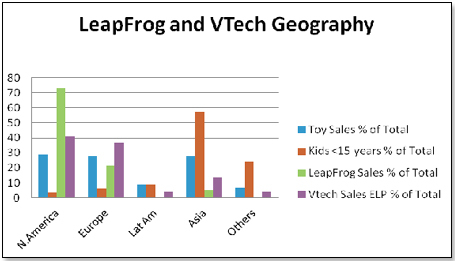 Internationally, VTech outsells LeapFrog about two-to-one. The reason for this is that LeapFrog until recently had all their products in English only whereas VTech made it a point to have any system of theirs perform in the native language of any major country they entered. Today, Leapfrog products are essentially only in two languages – English and French – whereas VTech’s electronic learning systems are in twenty-four. In fact, LeapFrog introduced their French version products into France only last year and immediately challenged VTech for market leadership. I understand that LeapFrog is working on additional languages but that this process will take them well into 2014 if not 2015. While VTech, too, has the majority of its sales in the kid-poor continents of North America and Europe, the company is clearly established in the rest of the world whereas LeapFrog is not. Both companies are working very hard at increasing their worldwide consumer visibility and thus expanding their international footprint. One strategy is to sharpen their credentials in education – after all, this is what they claim their products are providing. To this end, LeapFrog last month released the results of a study they had conducted amongst teachers. The survey found that 93 percent of the teachers surveyed would recommend LeapPad Ultra to other teachers and 97 percent would recommend LeapPad Ultra to parents. As one teacher from the study commented, "It [LeapPad Ultra] is a great device for every subject. My students would love to play the games. LeapPad Ultra allows children to have fun while still learning and they don't even realize it!" Another teacher in the study noted: "LeapReader is exactly what my classroom has been missing. As a teacher, it is a daily challenge to help 26 students read independently each day. With this tool not only will my students receive additional support, but they will also gain confidence in their independent reading. LeapReader allows them complete independence in learning letter formation and reading." Interesting, but the company did not release information as to where the study was made or the number of teachers involved. If pursued on a wider basis geographically, and underpinned by solid data provided by an independent and respected consumer research company, this could well open the way for LeapFrog to enter markets so far untapped. VTech on the other side is apparently trying to steal a march on LeapFrog by getting into China, the world’s largest potential market, through the backdoor. There are indications that the company is in talks with the Chinese Ministry of Education to sync the company’s product development with the ongoing educational reform drive undertaken by the authorities. If successful and then ultimately endorsed by the Chinese, this would effectively maroon LeapFrog in Hong Kong where they have a very decent business but which is, as a market, a tiny fraction of the potential on the mainland. 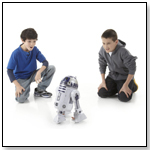 Over the long haul, I believe that VTech is the more likely winner in their competitive struggle with LeapFrog. For one, in an industry segment that is particularly receptive to technological innovation, VTech has an edge by virtue of its large and successful telecommunication business which is underpinned by an ongoing and significant R+D effort which has a synergistic effect on their learning product development. It has been suggested to me that LeapFrog could overcome its geographical disadvantage simply by being acquired by another entity whose sales footprint is more universal. The problem with this is that most major toy companies likely to enter into such an arrangement are as focused on North America and Europe as LeapFrog is. The only exception is Takaratomy, based in Japan, which has a strong business presence in Asia, Europe and the U.S. and who has this year been inordinately successful in penetrating Asian markets outside its Japanese homeland. Back in early 2011, John Barbour, the LeapFrog CEO, said that he was not averse to a prospect where LeapFrog would be acquired by another company “after it gets its business back in shape”. There is no question that he achieved this and that a take-over by a larger company is now feasible. The only questions remaining are who the likely acquirer is going to be and when this event is likely to take place.